This is the third and final post on how to make tortillas from scratch. These are corn tortillas, made from masa. They came out really delicious. We had them with beef tongue (tacos de lengua) one night, and I had cheese quesadillas the next night. 1. Pat the dough into balls about 1.5 ounces each. 2. I made 12 balls, for 12 tortillas. I took the other pound of masa, patted it into a large ball, wrapped it in plastic and froze them for later. If you plan to use the masa in the next couple of days, you can store it in the fridge. 3. 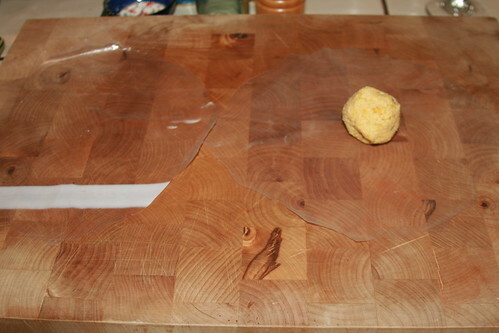 Cut two circles from a gallon-sized plastic freezer bag (you could also use a plastic shopping bag). The circles should be the same size as your tortilla press. Put one piece of plastic on the tortilla press, put a ball of masa on the plastic, then a piece of plastic on top of the ball, then press down until flat. 4. If you don't have a tortilla press (I didn't when I made these; I've since bought one), you can still make tortillas. Use the plastic circles as described above. 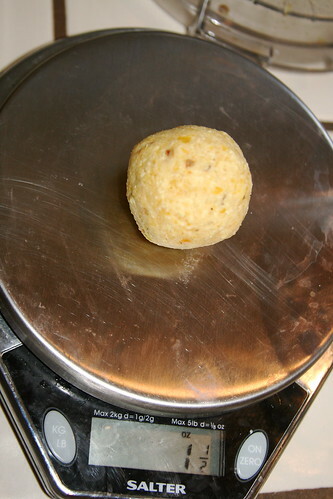 Then use a cutting board to firmly press down on the balls of masa. 6. Put the flattened masa in a very hot (medium high) cast iron pan. You don't need any grease in the pan. Heat for 1-3 minutes on each side. You will know when they are done when they bubble or puff up. 7. 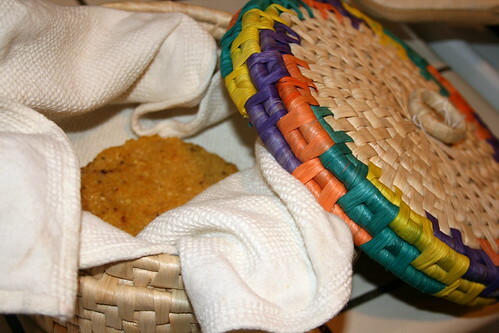 Keep warm in a basket and/or wrapped in a towel or foil until ready to eat. Eat as soon as possible or store in the fridge. You can also freeze them, or cut into quarters and fry in coconut oil or lard to make tortilla chips. After you boiled the corn and you were in the fermenting stage, did you allow the corn to ferment for up to 2 weeks? Would 1 week be long enough? Also, you said you didn’t use any fat in the pan to cook the flattened dough into tortillas. The pan was dry? or did you use coconut oil or lard? No I only let it ferment for 2-3 days. Yes 1 week would be long enough. I think 2 weeks would be ideal but you could ferment as short as overnight. It was not totally dry — it had a little leftover fat from being seasoned. You know since it’s cast iron. I just did not add any fat to it. I did add butter when I reheated them the next day. I have a Mexican Restaurant in the Bangkok area. Masa is a rare find. I used your recipe to make homemade corn tortillas and they are great. I had to use popcorn, but it did work well. Wish I could add a picture. Thanks for the Recipie. Would these totillas be flexable enough (after dragging through a lil oil or steaming) to roll into enchiladas? Yes, they are flexible — right out of the pan. You don’t need to steam or fry them. Thanks for these recipes. I live in Sweden and won’t be able to afford getting the corn you’ve used shipped over here. What about organic popcorn? Think that could work? There is hardly any corn in Sweden, and (boo hoo) very very few Mexican restaurants, Mexican food, etc. I really want to try these – my last attempt to get my husband to bring home sprouted corn tortillas on a trip back from the states resulted in tragedy when his luggage took an extra two days to show up. I have to tell you that I just ate some of the best tortillas ever and I used POPCORN. I worked just fine. No, unfortunately popcorn will not work. You need field corn or dent corn. We are occasional, not dedicated filmjolk eaters – we go back and forth between yoghurt and fil. I have heard that the fil cultures in the U.S. are old, old, old, from some originals brought over with Swedish immigrants eons ago! O.K. well now I have a big bag of popcorn and no corn tortillas. If I ask my best friend to bring me a bag of field corn he will just laugh, but that’s what I’ll have to do if I want beautiful tortillas like in the pics above! Other recipes I have found say you need to remove the hulls after soaking the corn. Can you buy hulled corn? Is there an advantage to buying corn with the hulls still on? Also, where can you buy the pickling lime? Only online? Can I use this recipe as a base for tamales? Yes you can. I just made tamales with it. I will be posting the recipe soon — check back! Just tried your recipe. I could not get the tortillas very thin using the ziplock bags. However, I switched to parchment paper. I smashed them, then rolled out thin with a rolling pin. I peeled off the top piece of parchment paper, and then put the tortilla in the pan, with the bottom piece of parchment paper still attached. After the tortilla had cooked a little, it was easy to peel of the other piece of parchment paper. I got REALLY thin tortillas this way. I just thought I would share this tip in case others are having trouble with the tortillas sticking and not coming off the ziplock bag. Excellent series, Anne Marie! I’m from Texas, too, and miss authentic tortillas (but don’t want to consume GM corn). Thank you so much for this recipe, I am making these tonight. So happy to have found your website, you make the recipes sound so easy. I even ordered tongue from a farmer. I will make them next. Do you know how could I make grits from this field corn? My husband loves grits and I would like to make our own instead of pre-packaged. I’ve made these three times so far. I’m so thankful for this recipe and clear instructions. I found Mrs. Wages near the canning supplies at the largest grocer in my area. The last time I added just a bit too much water to the masa. I have a very large food processor and tried to do too much at a time. The situation was remedied though by adding some chia seeds and processing again. I refrigerated the dough and by the time I was ready to make tortillas, it was just right. By the way, my son’s dog is wild about them–was immediately attracted to the nice corn aroma. I was just wondering what kind of food processor you need for this. Mine is not that strong and I’m worried that the corn my be too tough. Any thoughts? have you made tamales before with premade masa??? and if so does it spread the same and is it hard to get the same consistency??? I see that the lady in Sweden asked about using popcorn instead of dent or field corn. 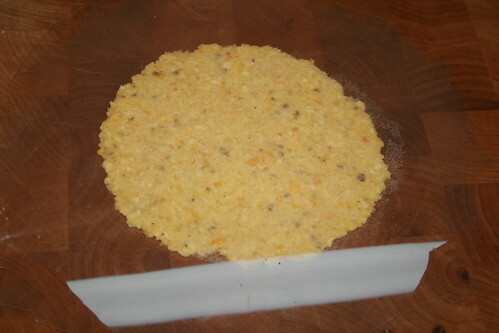 I was told that in order to make cornmeal, you have to have dent or popcorn in order to grind it coarsely like what we all know cornmeal is like. So, I am wondering why not popcorn? It is hard and dense like dent corn, so I would think it would work just fine. I’m so excited to see your wonderful recipe with clear, simple instructions! My goal is to make tamales with sprouted corn (organic of course) and tortillas…I did not see your tamales recipe on line , is it posted ? We have a table station in our home for grinding a variety of grains into fresh flour and rolling oats/flax for fresh oatmeal we have used since Sally Fallon began with ___Nourishing Traditions-we have not used store bought flour since! Thank you for sharing this!! First of all, I want to tell you how much I love your blog! I came upon it while searching for a recipe for corn tortillas. I alsowanted to add that I tried the recipe with organic popcorn (2 day ferment) and it turned out great! This is wonderful for me because I can buy it at the store instead of ordering online. :) I was wondering… have you tried to dehydrate the dough? I’m thinking that it might be a good way to make instant masa for storage. Wow, you are brilliant! I didn’t think popcorn would work (from what I read online). KUDOS to you! And yes, I bet you absolutely could do a dehydrated masa dough to make the masa flour. GO FOR IT and please let us know how it comes out! Yes my tamales recipe is online — I don’t think I’ve put it into the recipes page yet though. Hi Cheeseslave. Thanks for your recipe. Both me and my husband were surprised that the food processor would do the grinding necessary to make the dough and we SO delighted when it did! I have a question – have you heard of re-using the lime water? Much like a sourdough starter I heard a rumor that you can re-use the soaking water. Any comment? Thanks! I haven’t heard of that. Not to say it can’t be done – I just don’t know anything about it. Please report back if you find any links. Do you have to use a cast iron pan? Would an enameled cast iron pan be okay for heating the corn tortillas? Those are BEAUTIFUL and an impressive amount of work! I would love to try making them someday. How can you make the tortillas thin? I’ve tried the recipe a couple times now, and each time the tortillas wind up thick.. If I try to press them thinner, they stick to to Ziplock. I’d love to be able to get them thinner and softer like traditional corn tortillas. My friend’s mother used to make these for us. We would devour them as soon as they came out of the pan. Hey there, just wondering if my corn is still good. I soaked it for just over 2 weeks (kept forgetting to make them) and when I uncovered the bucket they were soaking in, I noticed a distinct odor… thinking this may not be a good thing. There’s no other way to describe the smell but that it’s very stinky. The kernels do look fine, but I just can’t get past the smell. Not sure when you may be able to reply so I’ll try to google the issue to see what I can find out. Fortunately I have enough corn that I can start a fresh batch today. Will take care not to make the same mistake again. 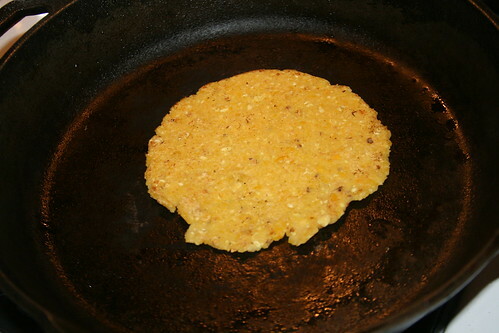 very good recipe for corn tortillas, I will try it. We only shop at “Wholefood” supermarket. Now I am surprise to know that they sell “Maseca”. I am from El Salvador and I have been making pupusas with Maseca and my family has been eating them. Well, the good thing is that I only make them for special occasions since it is a lot of preparation. Thank you for your article and the great photos. Even though I live in Mexico, the bought tortillas taste like cardboard, so I plan on trying your method. The tortillas from the market also have none of the texture and color that your tortillas do. I have a question about adding fresh sweet corn to the mix as you blend. Have you tried that to see if it would give a little more flavor? I know it’s not traditional, but I thought it might be something to try. Even though I like to experiment with cooking, I feel that Mexican cuisine is one of the world’s greatest…a little biased, I admit. I am a yankee from Southern California and I agree with you. Mexican cuisine is one of the world&apos;s greatest. I am practically crying over here with tears of joy!! Tortilla chips has been my #1 hardest thing to give up since real food has made an entrance into our lives and I’ve been searching for this very recipe. Thank you! Thanks so much for this recipe. Just finished my first batch of masa, and these tortillas are heavenly-way better than the cardboard like ones you get at the supermarket. Yum! From most Mexican recipes i see also that they generally use White Corn? Sodium bicarbonate is not the same and won&apos;t process the corn correctly to release the B vitamin Niacin, which is what the lime does. The Indians always used wood ash which when water is added makes the correct lime and the Mexicans did too then the "think they are so smart white folks came along" and said why waste time with the lime just grind the corn, in doing so between 1906 and 1940&apos;s 3 million Americans were affected by pellagra with 100,000 deaths from lack of niacin….So if you use wood to heat with or even a campfire with hardwoods, not pine, you should have plenty of ash. That is what I use. I am experimenting with it now since I have never had much mexican style foods, but I do love corn. I would prefer yellow corn, I think the white is just like everyone went to white flour and white rice long ago and lost all the nutrients when they refined them… tho white corn is whole corn, but I still think the yellow coloring must count for more Vit A. My family in Mexico adds pork fat and salt to the masa dough before frying it. It is how they’ve always prepared it. Enhances the flavor of the tortilla greatly and it is SUPER delicious! Can you use this same receipe yo make Tamales? I’m wondering what type of tortilla press you bought. I’ve been scouring the net for the best one for the best price…. not interested in the electric ones…???? Ideas anyone? Is this also the way to prepare homemade masa for tamales? Hi there, I know this is an old post but I’m just seeing it now! So I have blue corn. I let it ferment for over a week and rinsed several times. It processed beautifully, perfect texture. It is soooo bitter. I tried rubbing the kernels as I rinsed under cold water and it seemed to help somewhat. It’s like the lime won’t come out. Do you think I let it sit too long? It soaked into the corn. I suppose I’ll try another batch. Trying to trouble shoot, I’d love to ferment it longer. Any suggestions? Thanks!! There are many variations of blue corn, some taste good some not with or without lime… If you have any info on where from and what variety of blue corn it was it will help.. If you do some research on blue corn and what the Indians used, it is fascinating. I was into it 10 years ago so dont remember much now. You can still order and grow many heirloom varieties and help preserve them. Thank you so much for this wonderful tutorial. I made a batch up and fermented the corn for 2 weeks. The resulting tortillas were so delicious, and I was surprised at how flexible they were. They were actually stretchy! So much better behaved than those made from dried masa or (now I can say it) heaven forbid! store bought. There was absolutely no need to take the hulls off. I used airlock jars for the fermentation. Worked great and it was fun to watch the corn progress. I put a sign on it: Tortilla day is October 5th!